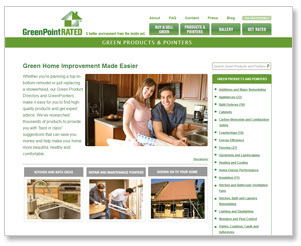 The Green Product Directory makes it easy for you to find high-quality products and get expert advice. We've researched thousands of products to provide you with "best in class" suggestions that can save homeowners money and help make a home more beautiful, healthy and comfortable. All listed products also meet GreenPoint Rated criteria for energy efficiency, resource conservation, water conservation, or indoor environmental quality. The new Directory is now housed at greenpointrated.com. Explore the products or suggest your own today!